When the class reunion committee first met last May, the Class of 1968 Endowed Scholarship was not on the agenda, nor did anyone mention any sort of fundraising. But the idea had already sprouted in the mind of committee co-chair Bruce Benson, and by the time he reached home after the meeting, it was firmly planted. The retired St. Olaf College pastor knew that other institutions benefited from alumni reunion gifts, so why not Augsburg? Dare he test a gift proposal among his peers? “If I hadn’t been on the committee, I don’t know if I would have proposed it,” he says, “but I thought, ‘let’s just see what happens.’” He emailed the committee members, respectfully acknowledging their other charitable commitments, making no assumptions about class members’ financial means or inclinations, yet exploring possibilities. Would they be able and willing to contribute? Would they resent being asked? Might such a project fizzle out before reaching its final goal? The response was unanimous: yes! Back in 1968, she pointed out, her guaranteed tuition ranged from $1,000 her first year to $900 her last, and her summer jobs covered the $500 for room and board. Those jobs—destroying old files in a sub-basement, sliding carbon paper between insurance policy copies—were anything but glamorous, thus convincing her that a college education was essential to a happy future. She has remained grateful to Augsburg ever since, and she will contribute $10,000 to the cause. Benson wrote to the entire class, identifying with how hard it might be to choose among competing responsibilities but also reminding them that they had entered the era of minimum IRA distributions and might be seeking a way to make a difference. So far they have donated more than $75,000 for the scholarship, which will be available to any student in need. “Clearly, I’m gratified. The response is very satisfying but not surprising,” Benson says. The Class of 1968, which graduated during a momentous year of assassinations and Vietnam War protests, was characterized by others as “different,” more engaged, active, and risk-taking than most. “Fifty years out, we all have an honest sense of how influential our education was. Whatever we didn’t like has faded away, and we realize this is a good thing. I’m also rather proud of what Augsburg has become since we were there,” he says. “I’m very impressed with what they’re doing. They’re incredibly inclusive, and service to the world around us is ingrained in them, just as it was ingrained in us,” Peterson adds. Five decades ago, Augsburg seemed trapped by its confinement in the city, with no place to grow and all the action shifting to the suburbs, Benson explains. Since then, however, it “has embraced its role as a city school and has become a good neighbor and resource. 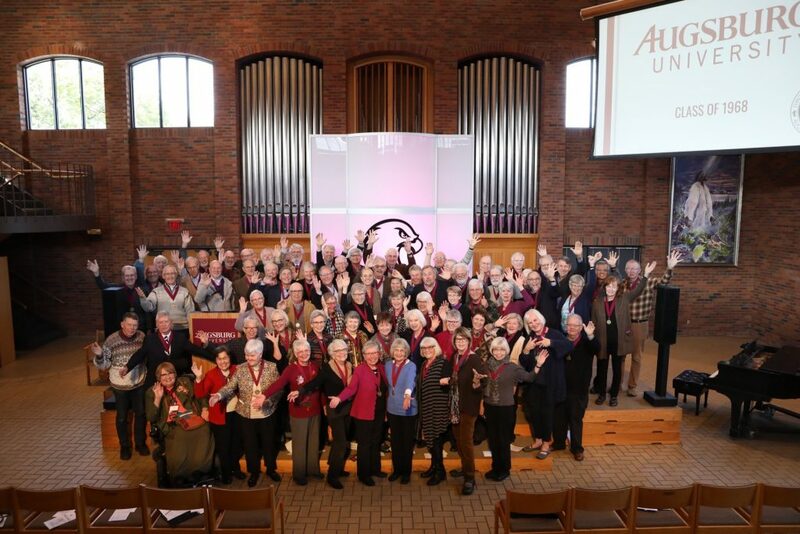 This gift will help the Class of 1968 say both ‘thank you’ and ‘bravo’ to Augsburg.